The ES-3300 is a workhorse that cleans up to 160 lbs of laundry per wash to food grade clean, removing 99% of the organic and inorganic contaminants. This innovative washing system uses a patented system of hydraulic pressure combined with a specific blend of detergents to effectively disinfect soft contents, personal protective gear and all types of sports equipment. 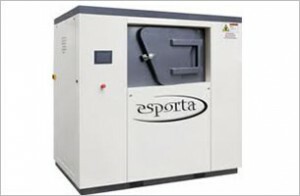 The Esporta Wash System is a complete washing system that has optimized a synergistic blend of detergents with the unique patented hydraulic pressure method of washing. The proprietary detergents and system recipes are engineered specifically for optimizing the cleaning application and each recipe is backed by independent laboratory validation. The Esporta Wash System utilizes hydraulic action to force both organic and inorganic contaminants out of the objects to be cleaned. Imagine walking into the ocean. Feel the force of the waves pushing against your body. Now imagine that same force pushing through your clothing. In the past 13 years over 15 independent laboratories have proven that the Esporta Wash System is more effective than traditional cleaning technologies in laundering soft contents, killing bacteria and removing both organic and inorganic contaminants while minimizing the impact on color-fastness wear life and optimal brightness retention.